Arthur, going about his business and marooned in a crowd, was confronted by a short and skinny girl wearing a Dalmatian mask, who thrust a pale blue cardigan into his hand, and without a word, vanished. 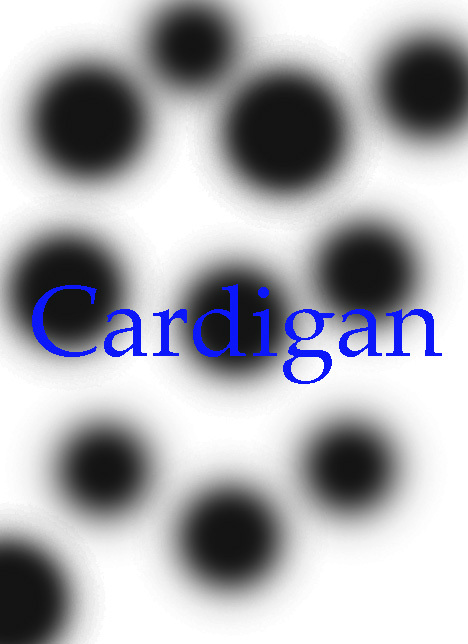 Arthur looked down at the blue cardigan, held it in his hands that started to tremble and shake. And then he opened his eyes. The leaves were rustling. A hulking Dalmatian vaulted out from behind a line of wintergreen trees. Arthur, panicking and afraid, closed his hand over the blue cardigan, and started running away. Another Dalmatian leapt out, as the sun grew fiercer and brighter. Arthur’s face carried fear. The kind of fear one experiences when driving through a dark tunnel, with one, single trace of artificial light. He feared this day would come. It was all out of his hands. And he didn’t know if he would ever get that back. The peace of mind, it was gone forever, and he couldn’t do a damn thing about it. Arthur hid behind a large, fearsome-looking rock. She looked so young before the metro shuttle smashed into her body, the bones snapping, her blood spraying all over the commuter crowd who were staring wide-eyed, their mouths agape, their voices silent. Blue fabric strands from her cardigan floated onto the platform deck. The dogs searched around the bushes, sniffing with their huge noses. Her eyes, Arthur remembered they were so blue and big, and they told a story of a sad and strong girl who fought to make it, do something with her life, winning at this game in the biggest city in America, bigger than NYC, windier than Chicago, and more authentic than Seattle. He couldn’t forget her face, like a permanent marker had smeared across his brain. Her eyes, they were so big and so blue. She had dimples dug into her soft cheeks. And her lips always looked red and full, each kiss tasting like butterscotch, or menthol. Arthur was scared, so scared he could feel Goosebumps crawling up his leg, resting on his inner-thigh, a living thing like a caterpillar trying to come back home. But the door was locked, as his own knees locked in place. He looked down at his hand. The cardigan was nowhere to be found. He cursed silently. Arthur couldn’t remember her name. It wasn’t short like Jen, or Pam, and it wasn’t long like Penelope, or Bethany. It was slender like Samantha. Contemporary like Rosemary. Even, simple like Anna. The dogs milled and moved around like a snake slithering in grass, their eyes red as a beating heart. Arthur took out his knife and clutched it close to his chest, as he prepared himself to stab all the breath away from the dog. The dog barked, and then proceeded to growl. Arthur heard footsteps, barely noticeable, slightly imperceptible, but with enough volume in sound to understand they were walking towards him, faster and faster, until they found him. He didn’t know if this was the end. What constituted as the beginning? His birth? The moment, he figured out she was dead, Arthur felt as though his soul had restarted to the genesis of the timeline. A like. A status-update. An emoji. A Meme. A single text. Another dog joined that dog, and then a third dog entered the group, all of them gaining ground on Arthur’s location. One of them found the blue cardigan lying in the dirt. He missed her, missed her like running late to a bus and having to lunge forward to grab the handle of the door before it closed shut. Today, Arthur could have been anywhere, anywhere but this miserable place, one spent and used-up like an empty ketchup packet. The sky opened up. Rain fell. And then the rain stopped. And a spot-light shined down on him. Arthur turned around and looked. He knew her. Knew her like the drawings inked into the fabric and material of a scuffed-up converse sneaker. But she wasn’t a drawing. It was her. Hannah. His wife. She was wearing a cardigan. The one he’d bought for her birthday. And then, he opened his eyes. He was back in the crowd of people. Arthur looked down at his hands and cried, as he curled his fingers around the pale blue cardigan.